When Should You Load The MAS90 2011 Tax Table Update? Several people have asked when they should load the 2011 tax table update for MAS 90 and MAS 200 payroll. As you may know one of the hidden gotcha’s of printing W2 forms via MAS 90 and MAS 200 payroll is the system uses the current FICA/MEDICARE maximum limits for determining how much goes into each FICA/MEDICARE box. For employees over the maximum limit at which tax is assessed MAS 90 simply supplies the current maximum rate from the FED tax table. At first glance since there is no limit change for the FICA/MEDICARE this year many users determined that it didn’t matter when they loaded the tables (ie – Before or after preparing quarterlies and W2 forms). Turns out according to Jim Woodhead over at DSD Business Systems that if you load the tax tables early your 941 form will show an incorrect overpaid status due to the 941 form using the NEW rate for employee FICA (4.2% for 2011). 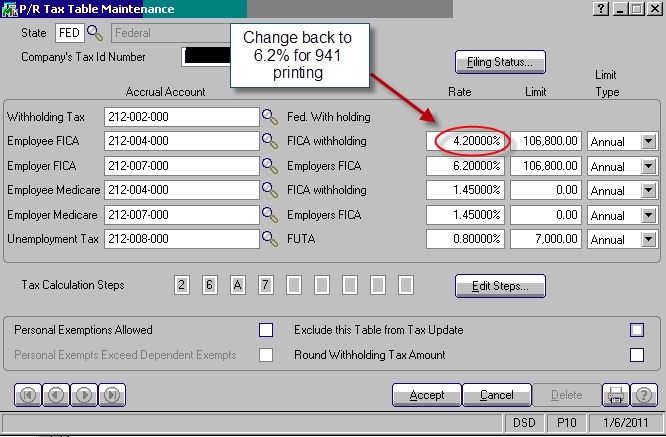 the solution is to manually change the FICA rate back to 6.2% while printing your 941 forms. PS – Don’t forget to change it back to 4.2% when you’re done printing. 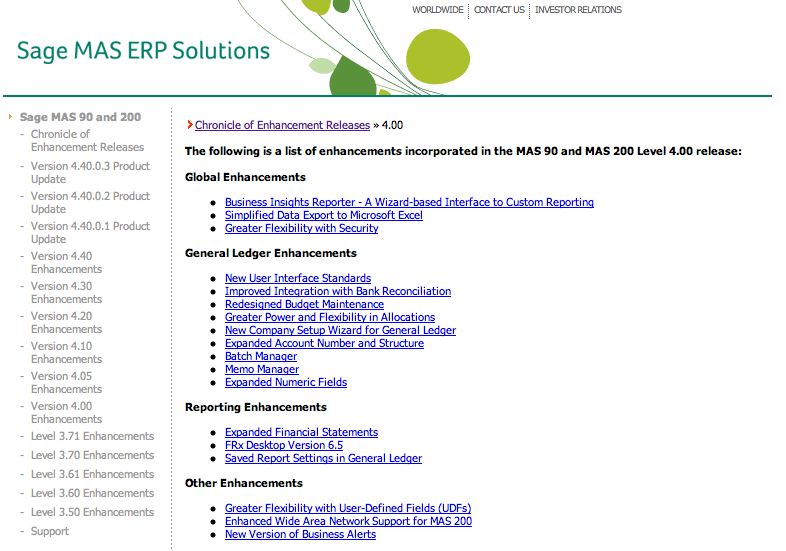 Here’s a handy chart outlining the new features of MAS 90 and MAS 200 4.x courtesy of Sage partner Faye Business Solutions of Woodland Hills California. This two page PDF does a fantastic job of showing exactly what was added to each module in versions 4.0 to 4.4. Download and stash this one in your toolkit so the next time someone asks you what’s been added in differing versions you can provide them with this reference. 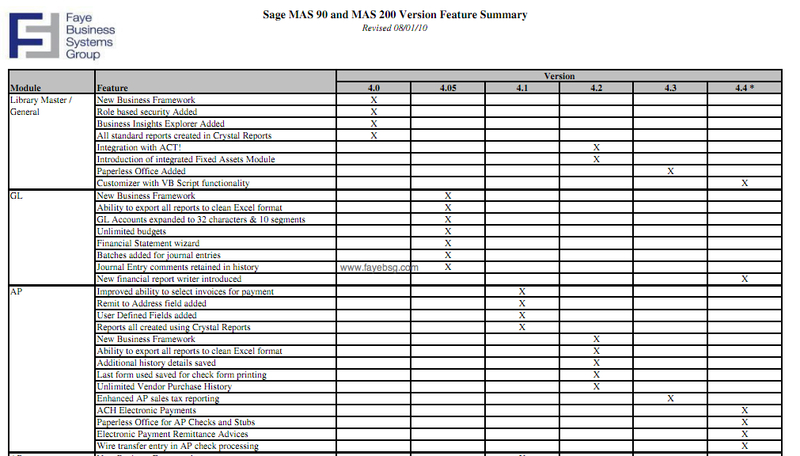 Jeff Schwenk of Bottomline Software has taken a few minutes to produce a great 26 page document that shows exactly what’s new in Sage Software’s new Product Update 1 which has just been released for MAS 90 & MAS 200 v4.4. 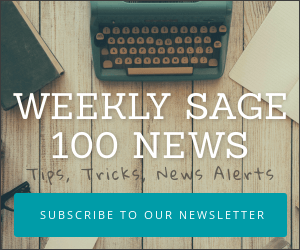 Unfortunately the what’s new guide that Sage supplied did not go into enough detail about the exact features – and where to find them. Upgrading your MAS90 or MAS200? Schulz Consulting is now fixed cost upgrades for users moving from any version of Sage MAS90 or MAS200 to the current 4.4 release. Instead of quoting a ranges of hours and rates – and then disclaiming unexpected events while expecting your company to shoulder the liability of any cost overrun – we provide one fixed price. This price includes your upgrade plus 15 business days of post-conversion support. Plus it also includes all of the items below. If your system has any MAS90 or MAS200 customizations, including Extended Solutions, which require upgrading we will assist you in locating a developer who can update your customizations for an additional fee. We’ve segmented our MAS90 & MAS200 upgrade pricing categories down into 5 different tiers. This means that smaller and less complex MAS90 users have a smaller fixed cost to upgrade than the larger companies with more users and complexity. When needed we will assist you in finding development assistance to provide a quote for upgrading any customizations or Extended Solutions.